RGD members pay Princess member ticket price. 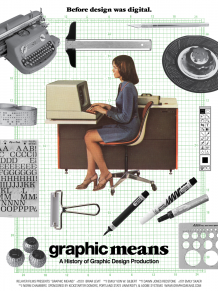 Graphic Means is a major new documentary charting the evolution of graphic design production. The film by Briar Levit marks around 30 years since desktop publishing revolutionised the graphics industry, and explores the progression to this point from the 1950s. The film features interviews with a host of influential names in the graphic design industry, including Steven Heller, Ellen Lupton, Ken Garland, Malcolm Garrett, Cece Cutsforth, Adrian Shaughnessy, Ian Swift, Frank Romano, Lucille Tenazas, Tobias Frere-Jones and Art Chantry. “It’s been roughly 30 years since the desktop computer revolutionised the way the graphic design industry works,” Briar says on the documentary’s website. “For decades before that, it was the hands of industrious workers, and various ingenious machines and tools that brought type and image together on meticulously prepared paste-up boards, before they were sent to the printer.